A collection unlike any other, Letters from Hollywood reproduces rare correspondence between some of the most notable and talented film industry names of all time-from the silent era to the Golden Age, and up through the pre-email days of the 1970s. Culled from university libraries, archives, and personal collections by filmmaker Rocky Lang and archivist Barbara Hall, this is the first time most, of these letters, memos, and telegrams have been printed in full, with many having never been seen by the greater public until now. Organized chronologically, each note is thoughtfully annotated by the authors to provide insight into the private world of its writer and recipient. Comprised of intimate messages exchanged between colleagues, friends, lovers, and rivals, Letters from Hollywood captures the larger-than­ life personalities and behind-the-scenes practices that would define the industry for years to come. This star-studded compendium also celebrates the lost art of letter writing-the romance and excitement of a personal typewritten or hand-scrawled message sealed and sent. 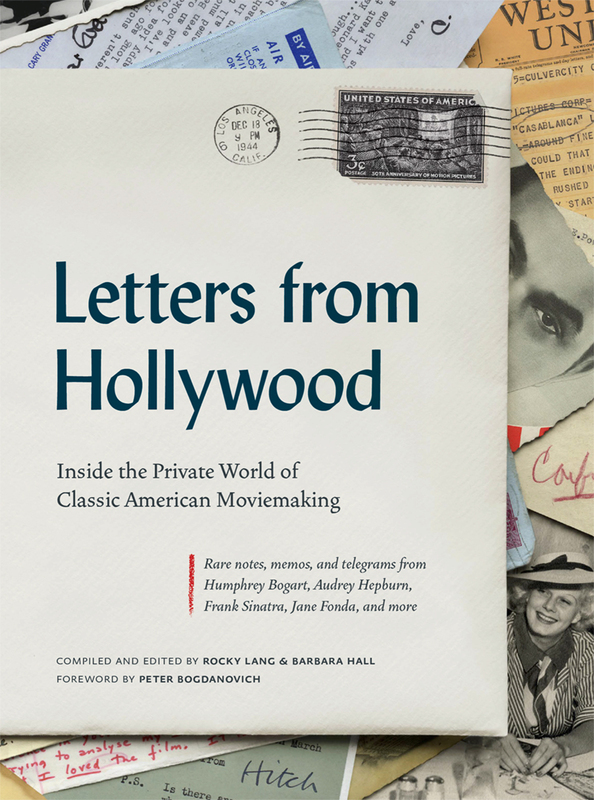 Letters from Hollywood’s extensive roster of contributors includes movie legends like Greta Garbo, Alfred Hitchcock, Katherine Hepburn, Marlon Brando, Elia Kazan, Cary Grant, Francis Ford Coppola, Tom Hanks, and more. Their letters offer all the intrigue and glamour of early Hollywood. and together they form a fascinating picture of a bygone, though not forgotten, era in American moviemaking. Have you ever wondered what Humphrey Bogart’s Snapchat account would’ve looked like? Neither have I. Instead, Letters from Hollywood offers us a unique behind the scenes look at the women and men who created Hollywood. And not with tawdry tales of backstage romances or underhanded deals, but with the creative prose of the filmmakers themselves, often in their most unguarded moments. From Bergman and Brando to Fonda and Flynn (with a little Mankiewicz included), this book is a treasure map inside the hearts and minds of the artists we treasure. Given that it’s such a forbidden pleasure to read other people’s mail, it is astonishing that no one has thought of this particular guilt fest before. Reading Letters from Hollywood is like eating popcorn; once you start, you can’t stop for the life of you. More interesting-and certainly more moving-than fairy tales from the National Enquirer, Letters from Hollywood is not merely gossip, it is sociocultural history as recorded by the movers and shakers of a unique time and place. What the reader will discover is as exciting-and revealing-as any of the movies these people made. This marvelous book recalls a day when writers took time to gracefully craft correspondence. No tweets or texts in Rocky Lang and Barbara Hall’s Letters from Hollywood. Instead, you will find handwritten and typed notes and telegrams with personal charm, deep angst, and true gratitude from the heart of the artists themselves. More than once these letters brought a tear to my eye. What a treat to bask in the personal lives of Hollywood royalty. It will make a splendid gift! Letters from Hollywood impeccably captures the Golden Age of Hollywood. This elegant and meticulously researched book by Rocky Lang and Barbara Hall took me back to my days as an usher at a Detroit movie theatre, when movies were the things dreams were made of. It offers a rare glimpse into the thoughts of the very people who created and defined the age. Reading each letter in the voice of its author brought these unforgettable characters back to life. I was transported to a magical and innocent time when, as a nation, we came together at the movies. These are those rare intimate moments that make us human no matter what our celebrity. Letters From Hollywood is a must for anyone who cares about who we are and where we came from. And of course, the soul of Hollywood, the good and the bad. Rocky Lang and Barbara Hall have decided to let you share the results of their treasure hunt.. Hold onto your copy: in the years ahead, it will be considered a rare and unique trip into Hollywood’s golden past unlikely to be ever be repeated. Letters from Hollywood is a cornucopia of delights, a walk down memory lane giving us a window into the hearts, minds. and passions of some of Hollywood’s greatest filmmakers and movie stars. Each letter reminded me of when movies were rich with content and ripe with character. A special delight. Ever since I was a child growing up in Argentina, I loved going to the movies. In the darkness of the theater, movies took me to another place and time. Rocky Lang and Barbara Hall’s Letters from Hollywood captures through letter writing the magic of the movies I grew up with. Each page is a treasure trove of memories.